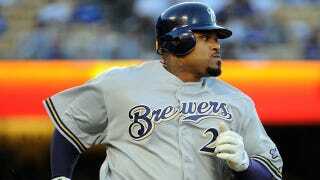 • The Nationals are today's presumptive favorites to reel in Prince Fielder. This makes sense on a number of levels: The Nats ranked at the bottom of their division last season in batting average, slugging, and runs scored. They're also backed by Ted Lerner, the richest owner in baseball. And the team has worked extensively with Scott Boras the last few seasons on the contracts of wunderkinds Stephen Strasburg and Bryce Harper, plus last year's $126 million splurge on Jayson Werth. • Coco Crisp appeared to be close to signing with the Orioles, but now it's starting to look like he'll wind up with the A's. • This person has spent his day trying to convince Ken Rosenthal that Felix Hernadez is Toronto bound. • Yu Darvish is getting his first taste of Arlington. • Those Jason Varitek eulogies in Boston may have been a bit premature. • The "new Hanley" Ramirez seemed to be OK with moving to third base. But not so fast. • Detroit seems to be willing to buck recent trends and deal its top prospect, 20-year-old stud pitcher Jacob Turner, in a deal for "the right pitcher." • Logan Morrison wins at Twitter.